In the spring of 2012 Google launched their Penguin update. This update to the search engine’s algorithms influenced how Google interpreted data when determining placement in search results, and for many websites it meant a sharp drop from the coveted first page placement down to the fifth page of search results, if not lower. However, the Penguin update wasn’t all bad, and not everyone was affected negatively by the update. 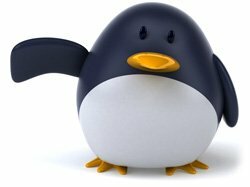 To really understand Penguin, you need to understand the way in which it affected your website’s SEO. Google’s Penguin update was targeted at those using poor tactics to improve search engine performance. The use of poor quality content, link stuffing and other spamming strategies were severely penalized by the initial Penguin update, and then signaled out further by the following updates to the new algorithm that followed suit within months of the initial launch. The good news is that most people who were using these negative practices were well aware of it. The problem is that many companies who were using these practices were successfully building search engine visibility for years before all was wiped clean overnight. If the Google Penguin update can be summed up in one short word it is quality. With the Penguin update Google became more cognizant of quality than ever before. This means quality content, quality links and a clean webpage design. The goal of the Penguin update was to sort out the bad from the good and give the user a better experience. To do this, Google rewarded websites whose focus was on the user experience, and continues to reward those companies now. Websites with high quality content who were providing the reader with information they were looking for gained credibility while those crammed with irrelevant and incoherent content for the sake of building keyword placement were scratched from the list of results. Penguin prompted the world of search engine optimization to apply even more focus to the quality of work being placed on the web. The old tricks that might have helped you capture quick placement once upon a time are no longer going to work. To continue gaining placement in the Google search results focus must now be on creating a high quality user experience. Anything less will find you a secure spot at the bottom of the search result pile. The Google Penguin update affected absolutely everyone. The way you approach your website’s marketing campaign must take into account Google’s most recent update, putting the power of the internet largely in Google’s hands. To build placement and gain traffic you will need to play by Google’s rules, and at the moment that rule is to use high quality content and stop taking shortcuts. Remember, the Google Penguin is updated regularly. If there is a shortcut you are using now, there is a big chance it won’t be there in the future. For the sake of your website’s search engine placement you are better off sticking with quality.